In search of the perfect cup of Americano. A challenge we presented ourselves in our recent trip to Boston and New York. At home we indulge in our own version of the Americano. First thing in the morning with my newspaper and another mid-afternoon with a tasty treat. It’s not a wake me up or pick me up. It’s a habit just like brushing your teeth. I could have one of these suckers and fall asleep within minutes. Caffeine just doesn’t seem to affect me. In Boston, we stuck with Starbucks and purchased colorful gift cards for each of us. However, we found the Boston Starbucks Americano wasn’t strong enough. With a Starbucks on every second block, there wasn’t an opportunity to try something new. When, we got to New York, it was the same thing. We stayed with Starbucks for the convenience. To our delight, the New York version was stronger. 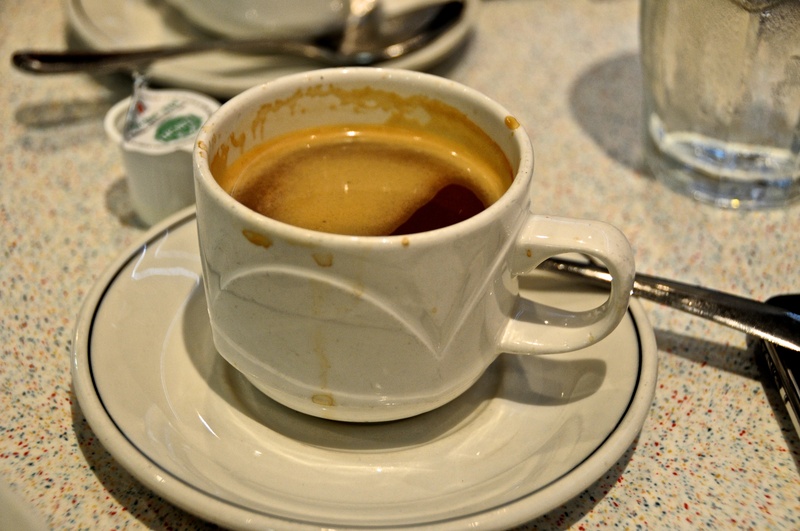 However, it was in the “Tick Tock Diner” located in our hotel “The New Yorker” (which is sometimes featured on the David Letterman Show) that we found our perfect cup of Americano. They call it the “double espresso with water” and it’s not on the menu. You would order it by description. It comes in a mismatched diner style cup and saucer. It’s so sloppy coming out of the espresso maker, the coffee droplets are all over cup. It was good! Our Starbucks card was put to rest and we indulged in our new found treasure for the remaining week. A couple of days after our return home, our Espresso Machine committed suicide. Because I had an early dentist appointment, I had my first cup of coffee without reading the paper. I decided to have a second cup in the morning with the paper and that’s when the poor little guy exploded. At 11:00 AM my habit was being compromised. I became desperate. I dashed out the door to Sears in hopes to find my replacement Breville on sale. At the store, I started looking at the Pod version coffee makers and then my desperation turned into exasperation. I gave up and headed to the nearest Starbucks for my Americano. A Kijiji search ended up with a $700.00 Breville “the Barista Express” for $400.00. This beautiful piece of equipment replaces my dead espresso maker and coffee grinder. I feel like a Barista. Maybe I should invest in one of those green Starbucks aprons to complete the look.